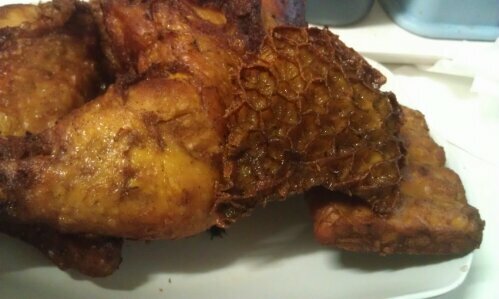 Ayam goreng – presented without comment, mostly. FRIED. TRIPE. I CAN’T EVEN. Need to go back for more. Disclosure: I ate as the guest of Kedai Satay on my first visit. But not on my second visit! I paid for that one. Edit: I recently went back to Kedai Satay to make a booking with a ‘zoupon’, which they refused to honour, claiming they were ‘fully booked’ for the night in question. As the promotion was ending soon, I was unable to redeem my voucher, which I’d paid $20 for. Poor form, guys. You may make good food, but that’s a pretty inconsiderate way to treat your customers. I was lucky enough to be invited along to a food blogger get-together at Kedai Satay by @euniceseow, who serendipitously became friends with the owner of Kedai on a skiing trip, if memory serves me correctly. Look at me, digressing already. Anyway, that night we sampled our way through the menu. This all happened about three months ago, so forgive me if the details are a bit hazy. We started off with some fried wontons (I don’t think they’re actually called that on the menu, but come on, look at them and tell me they’re not fried wontons!). In any case, they were quite good, sitting in a little pool of dark, sweet, sticky soy (kecap manis?). Next up were some crab and squid fingers. Like fish fingers, but lighter, more springy, and very more-ish. Then came the meats. Kedai specialises in Indonesian satay and grilled meats. And they certainly do it well. We were presented with a mountain of chicken and lamb satay, as well as two heaving plates of beef and lamb ribs. The satay had a great smoky flavour, and the sauce was a nice match – on the sweeter end of the satay scale, but it worked with the well-charred flavour of the meat. The ribs were basted in a sweet and sticky marinade, and the meat was tender and falling off the bone, for the most part. I think the lamb ribs were slightly better than the beef, but I’m always that way inclined. Beef is a bit of a nothing meat, in my book. We also tried some sort of chicken dish, I think it was the tropical chicken? Anyway, it was pretty good, if a little sweet. Are we sensing a trend here? Regardless, check out that egg! I had a wonderful evening that night – the staff were attentive and friendly, and everything was just great. Which is why I was a little shocked at my second visit. In hindsight, I guess it was a little naive of me to expect the same experience, as just looking at the prices on the menu (which are pretty insanely cheap) I should have known that it’s not really so much of a fine dining experience; it’s probably closer to a pub bistro or pho joint style eatery. The food comes out quickly, you order at the counter, and there’s a self-serve water and cutlery philosophy. Which is all fine and good, it just wasn’t what I was expecting, after being looked after so well the previous visit. Another irksome detail was the fact that we had gone to the bother of calling ahead and booking a table for five, and then no table was clearly set aside for us. It was fine, as they weren’t super busy, so we were seated without a problem, but still, if you’re going to take bookings, you should be reserving a table for the booking. And it should be a decent table, instead of directing me to the empty and unlit upstairs section. Just saying. Those hiccoughs aside, the food was once again enjoyable, and the bustling atmosphere – I insisted that we be seated downstairs – was a fun, convivial place to catch up with friends. So much so that I forgot to take photos! This time, we also tried the gado gado – pretty good, but lacking tempeh – and the soto betawi (a beef soup), which was nicely flavoured, but a bit difficult to share, as it’s a spoon and fork plate type of place, not a bowl and chopsticks type of place. So yeah, it’s a great, casual place, serving up some good grilled meats and other Indonesian fare, and I’d definitely go back, now that my expectations have been readjusted. I guess this is one of those instances where being a food blogger can actually distort your view of things without you noticing! I went to Garamerica for lunch with my friend D in South Melbourne, who claimed this Indonesian restaurant was ‘elusive’. This was mostly due to the lack of prominent signage on the street, and its tucked away location off the main Clarendon St drag. I started with the Martabak Telor (fried crepe with diced onion and minced beef). It was very different from the murtabaks I have tried before at Rich Maha and Bismi’s Gold and Fork, and more like a spring roll/parcel then a derivation of a pancake. I’m not sure I liked it that much. The onion was quite coarsely diced, and there wasn’t much beef. Still, not bad as a little appetiser. I also had the Gado Gado – a mountain of crisp vegies and tofu smothered in peanut sauce. An interesting twist to this Gado Gado was the inclusion of some chunks of a steamed rice cake, which at first I thought were huge pieces of potato. It made the rice I had ordered alongside the Gado Gado rather unnecessary. The colourful prawn crackers were cute (and always appreciated by this son of suburban Chinese restauranteurs). D had the Ayam Bakar (grilled chicken) which looked succulently juicy – of course, D ordered extra chilli – and the accompanying soup was surprisingly interesting. I noted hints of tomato, but it’s just always a pleasant surprise to get a real soup instead of a stock powder broth as an accompaniment in this sort of restaurant. Service was quick and cheery, and the restaurant is very reasonably priced (we spent $27 between us). Please note they accept cash only – there are ATMs nearby on Clarendon St.